I love this kind of food. It’s partly Scandinavian, partly Irish. The bread is sweet and quite cake-like (it’s a form of soda bread). I like the slight sweetness contrasting with the saltiness of the mackerel but, if you want something lower in carbs, use plain rye bread instead. The bread recipe here is enough to make two small loaves. Just halve it if you only want one…but it always seems a bit pointless to put the oven on for just one loaf. To make the bread, preheat the oven to 180°C/350°F/gas mark 4. Mix the flours and oatmeal with the salt and bicarbonate of soda. Add the butter and rub it in with your fingertips. Stir in the sugar. Make a well in the centre of the mixture and gradually pour in the stout, followed by the treacle and then the buttermilk. Mix these liquids in with a butter knife as they are added. You will end up with a pretty wet mixture and won’t believe it will ever turn into bread. Divide it between two small buttered loaf tins (each should measure 19 x 9 x 5cm/7 ½ x 3 ½ x 2in and they should be 5cm/2in deep), and sprinkle each with the jumbo oats. Put into the oven and bake for 40–50 minutes. To test whether the loaves are ready, remove one of them from the tin and tap the bottom. If it sounds hollow, it is ready. If not, return to the oven for a little while longer. Be sure not to overcook, though, or it will be dry. Turn out of the tins and leave to cool on a wire rack. Peel the apple, core and cut the flesh into matchsticks. Put immediately into a bowl with the vinegar and mix to coat. Sauté the onion gently in ½ tbsp of the olive oil for about 1 ½ minutes. You don’t want to colour or even soften it much, just take the raw edge off it. Add to the bowl with the apples. Remove the thick central rib from each of the cabbage leaves then roll the leaves up and cut them into shreds. Add this to the bowl with the remaining olive oil, sugar, poppy seeds and seasoning. Peel the beetroots and cut into matchsticks. Add to the bowl at the last minute (if you add them earlier, they bleed over the other ingredients; a little of this is fine but it looks better when it hasn’t gone too far), then scatter the salad with microleaves (if using). 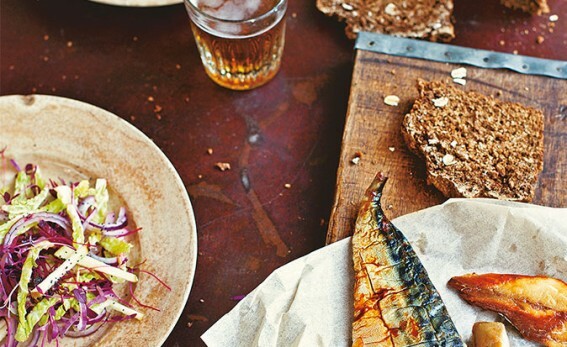 Serve the smoked mackerel with the bread and salad.